← 130 Years after Edison’s First Power Plant, Is Energy Storage Finally a Reality? In the energy industry, it is important to distinguish between short-term trends and long-term trends. Just seeing the short-term can result in missing a contrary long-term trend. For instance, in 2008 natural gas prices rose to all time highs. Yet the shale gas boom and economic downturn was just waiting to change the paradigm. This year, coal generation in the U.S. is expected to rise from 37% in 2012 to 40% while gas generation falls from 30% to 27%. Without more information, you might think that the two sources of generation are reverting to their historic means, and that no big transformation is going on. But deeper study suggests that numerous coal units will be retired over the next few years and that coal will be a declining generation source in the future. The same is true relative to our recent writing about the potential for Mexico to become a significant natural gas producer. 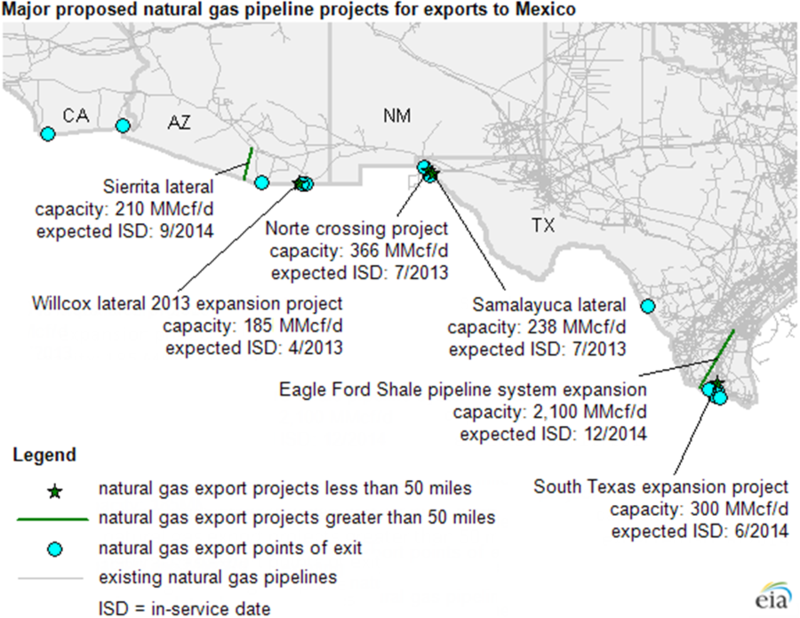 In the near-term, Mexico will become just the opposite – a robust export market for U.S. gas producers. And exports this year may approach 2 Bcf/day. Numerous new pipelines are under construction to move gas south. This will increase export capacity to over 9 Bcf/day by 2015 according to recent presentation by Platts/Bentek. Indeed, Bentek expects U.S. gas demand plus exports to increase from today’s 66 Bdf/day to over 80 Bcf/day by 2018. 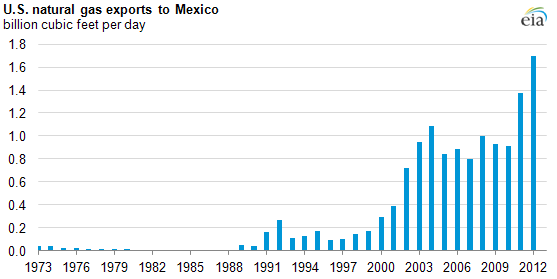 Contributing to this growth is domestic industrial and power plant demand, LNG exports, and exports to Mexico. We thought it is important to point this out since too much talk about long-term Mexican potential might cloud an understanding of gas markets over the next few years. U.S. Natural Gas Winter Outlook, presented by webinar September 26, 2013. This entry was posted in Natural Gas and tagged Liquefied Natural Gas, Natural Gas, Natural gas education, Natural gas industry, Natural Gas Markets, Natural Gas Prices, Natural gas supply. Bookmark the permalink.